Assemble your own USB motion sensor and learn to code with the Kano Motion Sensor Kit. The included step-by-step storybook shows you how to assemble your motion sensor and helps you learn how to program games and apps that use motion as a means of control. 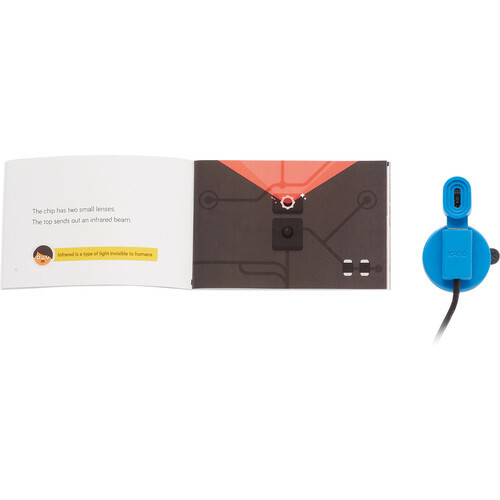 The Motion Sensor Kit is designed for computer enthusiasts aged six and up. Assemble your Motion Sensor Kit with illustrated steps and learn all about sensors and data. The motion sensor detects three directions of motion at a time – left/right, forward/backward, and up/down – and sends the data to your computer. You can use it to make and control games, create artwork, or generate sounds and music. The included USB extension cable lets you move the senor around without it being plugged directly into your computer. The suction pad helps keep the motion sensor flat and steady on nearly any surface, horizontal or vertical. The included stickers let you customize your motion sensor. Help the bird avoid the pipes in this game. Control its vertical motion with your hand and code how fast it flies and how many pipes it comes across. Control the turntable with your hands, make noise, and mix tunes. Code your own digital, two-dimensional ping-pong game reminiscent of retro arcade games, and control the paddle directly with your hand. Control the motion of your digital yo-yo with the motion sensor. Learn code and explore the world as you rotate the map and zoom in and out with the motion of your hands. Box Dimensions (LxWxH) 13.45 x 6.25 x 1.15"